Choosing the perfect sewing machines for regular home use. 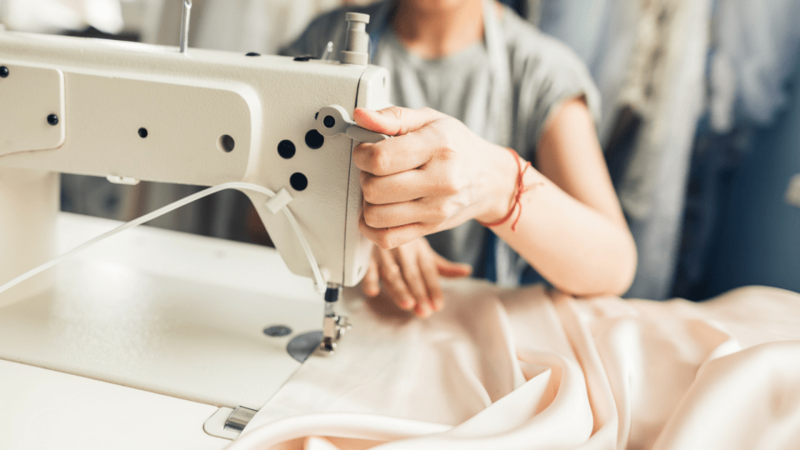 Sewing is a part of many of us and having the best sewing machine for the job makes it even better. In this buying guide, we will go through some of the best selling sewing machines that can be easily used at home. This Brother Sewing Machine is a computerized and lightweight sewing machine that has 60 built-in stitches and 7 styles of one step auto-sizing buttonholes. This machine is very affordable and can be used for many different purposes from crafting and quilting to home decoration. According to the product description some features that you might like about the item include its ease of use, its LCD panel, and its quickset drop-in bobbin and thread cutter. This Brother sewing machine comes with a limited 25-year warranty. Can be operated by the foot pedal or its one-touch button. Auto-set drop-in bobbin, auto threader, and a dial to control the tension. Do not let the light weight of this computerized Brother sewing machine fool you. It is absolutely packed with features that you will surely appreciate if you purchase it. 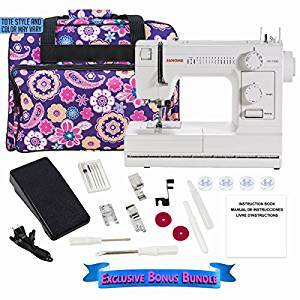 Whatever your sewing interest is, whether you sew for quilting, decoration, or crafting, you will love the 60 built-in stitches that come with this Brother sewing machine for an affordable price. This Brother sewing machine is described as being very easy to use and operate. You can control the machine through the LCD display. Stitch selection is made through the screen – you simply choose a stitch on the display and the machine will automatically start sewing it. The display is also handy for when you wish to adjust the stitch length and width. A great feature of the Brother sewing machine is its dial that will adjust the upper thread tension. We also like the choice offered by the Brother CS6000i that allows the user to operate the machine either by the foot pedal or the start/stop button. For our readers who need a machine that will reverse stitch, look no further, the reverse sewing button on this unit will make sure that your stitches are locked in and won’t unravel. This product obviously is comprised of a great deal of features, and it comes with a limited 25-year warranty. Would we recommend the CS6000i Brother Sewing Machine to our readers? We are very happy to recommend this product for small jobs or for those just getting started with sewing. We think this because at this price it is a great value machine. However, because of the reports that it doesn’t last very long and that it tends to jam when used with certain materials, we can’t recommend it for all cases. We encourage our readers to have a look through the product reviews anyway to see what machines the customers recommend for more advanced projects. The singer 4423 ranks as our second best sewing machine for home use, simply because of its outstanding features and functionality that has inspired positive reactions among thousands of users. Below are some of the handy features that has made it stand out. The Singer 4423 has demonstrated excellent performance, thanks to its quality features. The machine has stayed true to its purpose of ensuring that it excels in sewing through tough materials seamlessly. This is made possible by the impressively high speed that comes from its super powerful motor and the stainless steel bedplate that it comes with. The Singer 4423 is very powerful enough to take on big projects and equally efficient. It has an automatic needle threader to save you the time and frustration required to do your own threading. Its top drop-in bobbin system is another convenient feature of the machine. 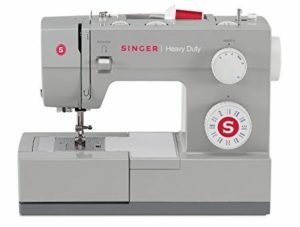 The Singer machine makes it possible to efficiently work on almost any project out there with ease, moreso with the 23 built-in stitches and the one-step buttonhole. And with its adjustable tension one can get the best quality stitch regardless of the fabric or material being used. Some of the other handy features that makes the machine even better performing and lovable include the 3 needle positions, the 5 mm stitch width and the free arm. The 7258 Singer Sewing Machines are able to stitch for all types of sewing, including fashion sewing and quilting. It has 100 stitch patterns, a handy automatic needle threader, and an adjustable sewing speed. You can also use it for buttonhole sewing with a simple one step process and it comes with a 25-year limited warranty. It definitely seems like a highly customizable sewing machine that is flexible enough to do a great deal of projects. Singer 7258 Sewing Machine weight: 14 ¾ pounds. Select stitches through a push-button interface. Singer sewing machines speed can be adjusted. Dimensions of 15” x 7 ½” x 12”. Singer sewing machines have a limited 25-Year warranty. The 7258 Singer sewing machines come with lots of included accessories. SINGER 7258 Stylist Model. You will be really impressed with the wide array of features that are contained in this one sewing machine. The competence and flexibility allows you to make lovely garments and gifts quickly and easily. If you are in need of a machine for intricate projects then you are sure to appreciate the electronic speed control of this Singer model. It allows you complete control over the machine without having to use the foot controller. Regardless of which fabric you are working on, the Singer sewing machines automatic tension system will ensure excellent stitch quality. When you choose a stitch it will automatically adjust the optimal settings of the length and width. If this isn’t desired for your project then you can simply personalize your length and width choice. It has also been designed to reduce the occurrence of jams by incorporating a top-loading bobbin system. You won’t have to worry about overfilling the bobbin either because the winder stops automatically once it has been filled. The long list of accessories that come with this product includes spool caps, a screwdriver, and a lint brush. We are really impressed with Singer Sewing Machines based on the research that we have undertaken. There are so many different aspects of it that customers really like. We also love that it is easy to use and flexible enough to complete many different projects. However, the negative feedback about the machine’s functionality has made us a bit leery of it and we feel that we can’t back this product 100%. The Brother SE400 Computerized Embroidery Sewing Machine is designed to give your projects a high end look and still fit your budget. It is described as the perfect machine for any project and has a wide range of designs, stitches, pattern combinations, and lettering fonts. It also comes with a wide assortment of accessories. Comes with a 25-year limited warranty. Easy to use LCD display with backlight. Brother sewing machine dimensions: 20.3” x 15” x 15.2”. Comes with 5 monogramming fonts. Seventy embroidery designs built in. The Brother sewing machine has one hundred and twenty frame pattern combos. You can connect it to your computer. The SE400 Brother Sewing Machine was designed to enable the user to create projects with a customized high-end look without having to break their budget to purchase it. The SE400 is described as a very convenient sewing machine and without a doubt, one of the best sewing machines for home use. The ease and convenience at which this machine operates is due to its easy bobbin winding system, its push button thread cutter, and its drop in top bobbin. You will be pleased to know that it also comes with a large range of accessories. This brother sewing machine will definitely be easy on your eyes – the backlit touch screen is nice and bright and its automatic needle threader means that you no longer have to thread the needle yourself. It’s also great for embroidery. It has a wide array of built-in designs, fonts, and frame patterns that make it ideal for crafting or for making personalized gifts. It will suit all of your needs if you need a machine to help you embroider clothing or towels. If you are a budding fashion designer looking for a feature-rich yet affordable sewing machine then the Brother SE400 is definitely worth considering. On to the positive reviews now and it is here that we find the general view for the value of this Brother sewing machine. The most prevalent compliment that we found for the product was for its user-friendly nature. 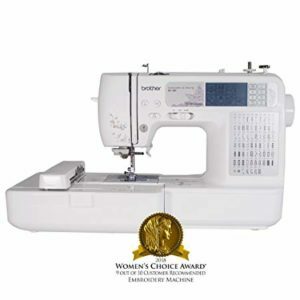 Most customers have found that this sewing machine is very easy to use, which may be in part due to the instructional video that comes with it. Other features of the Brother Sewing Machine that customers seem to love include the easy-to-use needle threader, the USB port that allows you to embroider designs from the Internet, the thread cutter that will cut your thread at the end of your design or between each letter, and its low price. There is a great deal of features of this product that customers are satisfied with. The Brother PC-420 PRW Limited Edition Project Runway Sewing Machine is a high end computerized machine that has had some great feedback. One thing we like about it is that its My Custom Stitch creation program allows you to save your designed stitches to the machine’s memory and quickly access them later using the built-in LCD panel. Other benefits of the product include that it comes with a 25-year warranty, that it can control digital stitch length and width, and that you won’t have to search for the eye of the needle due to its advanced threading system. Comes with 294 utility and decorative stitches. The Brother sewing machines are computerized. Stitches are already pre-programmed and are available for use at the touch of a button. The PC-420 Brother Sewing Machines comes with a 25-year limited warranty. You can design stitches using the machine’s built-in LCD panel. The Brother sewing machines have a twin needle function. The Project Runway model Brother sewing machines have been designed to fuel your creative impulse. It will allow you to create fancy looking clothes that you can quickly fill your wardrobe with. It comes with a huge range of 294 built-in stitches and will suit novice and professional sewers alike while meeting the most unique of preferences. A great feature that we are sure that our readers will appreciate about this machine is that you can design stitches with the LCD display panel and save them into the machine’s memory so that you can access them later. The Project Runway Brother Sewing Machines also have a programmable thread trimmer that will cut the thread at the end of a task. It also has an advanced needle threading system, which you will be pleased to know means that you no longer have to search for the eye of the needle and waste time doing the threading yourself. Save time and energy by using this feature. It is clear that, based on the features of the PC-420, the Brother Sewing Machines are extremely customizable and should be able to handle many different projects. The Janome HD1000 is an impressive heavy-duty sewing machine that is also light enough to be taken on the go. This effective machine has a cast aluminum body, a drop feed, a free arm, and an automatic needle threader. Having complete control over the tension has never been easier with the product’s easy to adjust tension control. By purchasing this sewing machine you can make use of the 14 built-in stitches including utility and stretch stitches as will as a simple to use 4-step buttonhole. You will also be able to sew cuffs, pants, and collars like a professional using the machine’s free arm. Another feature of the product that you will certainly appreciate is that it can sew up to 840 stitches per minute! The built-in needle threader makes it so easy to thread needles. Simply pull down the threader, put your thread in the hook, and pull back. It also comes with a variety of included accessories including bobbins and felt. You will find an accessory storage compartment on the machine so that you can keep all of your new accessories on hand. There has been no serious criticism of the product and the customers seem to have received great value since purchasing it. If you’re looking for a relatively inexpensive sewing machine for everyday use then we think you’ll be very pleased with this product. Reviewers have noted that it’s the best machine that they ever used and certainly the best in the price range available, which has increased our confidence in this recommendation. The Magnolia computerized sewing machine is one of the many great value Janome Sewing Machines that are available for purchase on the market at the moment. One thing that you are sure to love about it is its automatic needle threader. No longer will you have to strain your eyes. This tool will also easily adjust the length and width of the stitch simply by pushing a button. Other benefits of the product include that you can use a button to sew, which means that you don’t have to use your foot, and its bright LED screen that will enable you to select stitches quickly and easily. Automatic needle threader – You no longer have to strain your eyes and spend time threading the needles yourself. Stitch length and width adjustment – You can make customizations with the touch of a button. The Janome sewing machines have optimal thread tension. Bright two-digit LED screen – Makes stitch selection a breeze. 6 one-step buttonholes – Sews buttonholes quicker than ever. The Janome sewing machines are drop feed capable. Foot control unnecessary – The machine has a start/stop button that controls it. Free arm feature – You can sew pant legs and shirt collars. The Magnolia 7330 computerized Janome Sewing Machines are comprised of many sewer-friendly features. As the title suggests, it has 30 built-in stitches, including 6 one-step buttonholes, which give the user a lot of options for creativity. A great benefit of the machine is its LED screen. It displays the number of the current stitch and helps the user to choose the width and length of the stitch. The automatic needle threader is another feature that will save you time and that you are sure to appreciate. The Janome Magnolia also has a see-through bobbin cover. This handy feature means that you will know ahead of time when you are running out of thread. Finally, you can control the tension of the Janome sewing machines simply by using a dial so that you can complete your projects in an effective manner. We are amazed at how positive the feedback is, and all of the people who purchased it seem to be very satisfied. Further, it’s a great machine for a beginner just starting out (the adjustable speed will help you here) and also for big projects (it can penetrate several layers without slowing down). 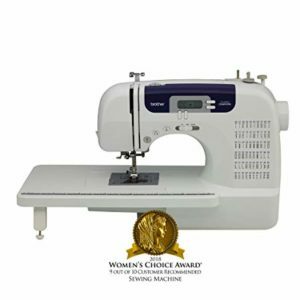 The list above, is our handpicked best sewing machines for home use that offers the best performance and backed by thousands of customer reviews who can swear by them.